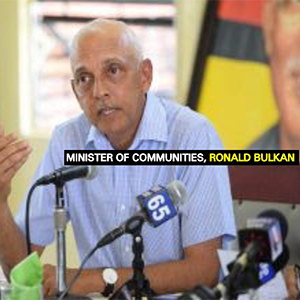 Minister Ronald Bulkan is seeking to set the records straight on the constitutionality and legality of the APNU-AFC administration. The Ministry of Communities brought together senior staffers for its annual conference in the capital city yesterday. Speaking at the conference, Minister Bulkan sought to dispel the contention that the administration should be seen as a caretaker government. He maintained that the administration is legal. He said it is important that persons at the regional level understand what is taking place. He reminded those gathered that in the execution of their duties they are not acting illegally. There have been allegations that the government is illegitimate and public servants should be very careful when carrying out instructions. The Minister urged those gathered to focus on their professional responsibilities, as he cautioned against, what he termed a “campaign” against the government.